Started in 1977, by a group of 17 California blacksmiths, CBA has developed into a thriving group of blacksmithing enthusiasts, including both amateurs and professionals. We are a diverse group of men and women whose common interest is is a passion for metal. 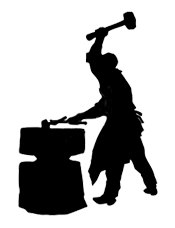 Our non-profit, volunteer organization is dedicated to keeping the tradition, art and craft of blacksmithing alive. CBA offeres three levels of membership: individual, family and business.